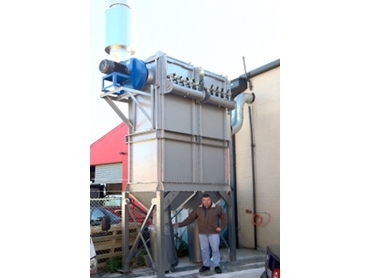 Australia’s leading dust collection systems specialist, Polex Environmental Engineering introduces a new range of modular dust collectors designed to achieve significant savings in energy. Featuring a modular design, the new Polex dust collectors incorporate high efficiency fans to save on energy costs. All units can be fitted with a VSD (variable speed drive controller) featuring an air flow sensor that will communicate with the Polex control system to lower the fan motor’s power usage when one or more slide dampers or blast gates are shut off. For instance, a system with 12 outlets at 12 machines requires a 30 kW motor on the fan to provide adequate suction. If 6 outlets are closed off, the air flow sensor will communicate to the Polex control system to cut power to the motor to run at 50% power, resulting in cost savings over the life of the dust collector. Polex will be showcasing their modular dust collectors on Stand 3222 at the AWISA Exhibition from 11 to 14 July 2012 at the Sydney Exhibition Centre, Darling Harbour.